The area is accessed by three facilities meeting the latest safety requirements. T-bar lift of 1.6km with a capacity of about 2000 people per hour and a height difference of 479 meters. The facility will take you from 1750 meters above sea level. at 2220 meters above sea level up, far beyond the tree line on a beautiful plateau with fantastic views of many four-thousand. 3 - Children's ski lift "Pony"
The children's ski lift is located at the mountain station right next to our panorama restaurant "Mäderlicka". The parents can rest on the large sun terrace while the children practice skiing next to it. The use of the children's lift is free! 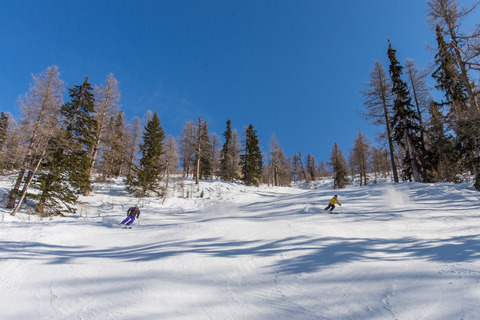 In our ski area, about 25 kilometers of pistes are prepared by machine and partially artificially snowed. The difficulty levels of the slopes are marked blue (easy), red (medium) and black (difficult). In addition to the groomed slopes, our area has many freeride opportunities.